* Critical discourse analysis. The analytic technique of critical discourse analysis is brought into the area of family literacy. The detailed explanation, interpretation, and demonstration of critical discourse analysis will be extremely helpful for novices learning to use this technique. This is a timely book, for there are few ethnographic studies exploring the usefulness and limits of critical discourse analysis. * Combines critical discourse analysis and ethnography. This new synthesis, which is thoroughly illustrated, offers an explanatory framework for the stronghold of institutional discursive power. Using critical discourse analysis as a methodological tool in order to build critical language awareness in classrooms and schools, educators working toward a critical social democracy may be better armed to recognize sources of inequity. * Researcher reflexivity. Unlike most critical discourse analyses, throughout the book the researcher and analyst is clearly visible and complicated into the role of power and language. This practice allows clearer analysis of the ethical, moral, and theoretical implications in conducting ethnographic research concerned with issues of power. * A critical perspective on family literacy. Many discussions of family literacy do not acknowledge the raced, classed, and gendered nature of interacting with texts that constitutes a family's literacy practices. This book makes clear how the power relationships that are acquired as children and adults interact with literacy in the many domains of a family's literacy lives. 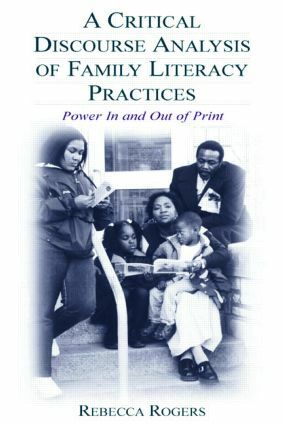 A Critical Discourse Analysis of Family Literacy Practices: Power In and Out of Print will interest researchers and practitioners in the fields of qualitative methodology, discourse analysis, critical discourse studies, literacy education, and adult literacy, and is highly relevant as a text for courses in these areas.